100% PURE Silicone of the highest quality! Approved by both LFGB and FDA. Completely FREE of any unwanted toxins, chemicals, or fillers & passes the pinch test! We made sure to use the best silicone possible. One giant gummy bear made with our mold is equivalent to 1,050 regular sized gummy bears... That's approximately 2,190 calories and 2 pounds in a just a single gummy bear! MORE THAN JUST GUMMY BEARS! Our molds are versatile, meaning you can also create various different bear-shaped products such as chocolates, mousses, cakes, breads, frozen treats, and more... Even other fun products like hand soaps, bath bombs, or candles! Convenient storage and gift giving! To make things convenient, we included 5 Food-Grade bags for you to make and gift your giant bear creations! The bags are also perfect for simply storing treats for later snacking! Even gifting the mold altogether makes an interesting and exciting gift! Perfect for occasions and events! Surprise and intrigue your guests with giant gummy bears, which you can serve with different flavors and multiple pieces... All of which can be made using only one mold! Designed and crafted completely by Mister Gummy, with careful attention to shape and structural integrity to present a mold we are humbly proud to offer! Have any issues, questions, concerns, or comments? Please feel free to contact us via email and we gladly assist you! Satisfaction guaranteed. 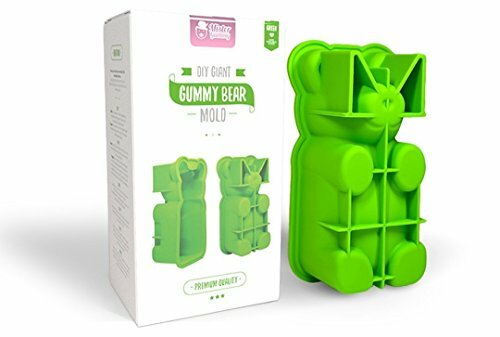 Mold Dimensions: 7.6" x 2.75" x 4"
Finished Gummy Bear Dimensions: 7.125" x 2.625" x 3.375"
Freezer and oven safe within temperature of (-40 to 450°F). PREMIUM QUALITY SILICONE: LFGB/FDA approved, BPA FREE, Food-Grade, NON-Toxic, Safe, 100% Pure Silicone. Highest quality assurance! YOUR OWN INGREDIENTS: Create healthy, nutritious, and delicious bear shaped treats the way you want it! Eliminate or replace unwanted ingredients and control your flavors; catering toward your own personal preferences. We also included our own recommended recipes with directions right on the box to help you get started! STORAGE-GIFT BAGS INCLUDED: Especially for your convenience, comes with Food-Grade Gift and Storage Bags for you to store your finished gummy bears in for later snacking or to prepare as a delicious gift created personally by you! MISTER GUMMY'S 100% ORIGINAL DESIGN: Designed and crafted completely by Mister Gummy, with careful attention to shape and structural integrity! 100% SATISFACTION GUARANTEE! Have any issues, questions, concerns, or comments? Please feel free to contact us via email and we will gladly assist you. Your complete satisfaction is a top priority! If you have any questions about this product by Mister Gummy, contact us by completing and submitting the form below. If you are looking for a specif part number, please include it with your message.